As the weather gets warmer, I start to crave salads. 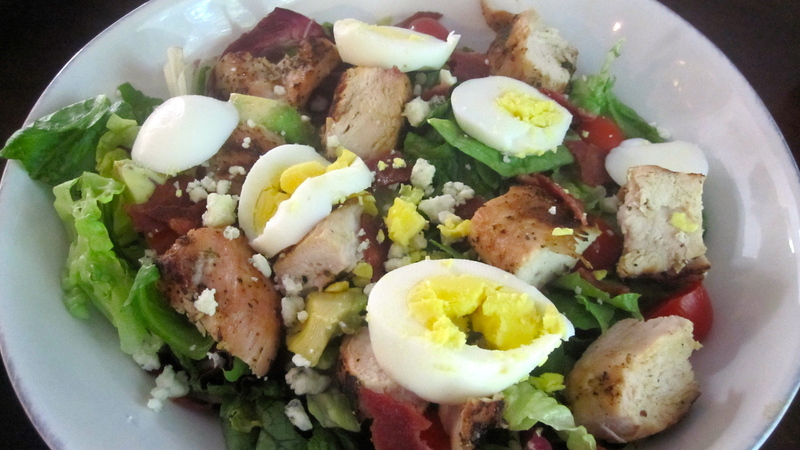 One of my favorite salads is the Chicken Cobb with Avocado salad from Panera. Unfortunately, it isn’t the healthiest salad. 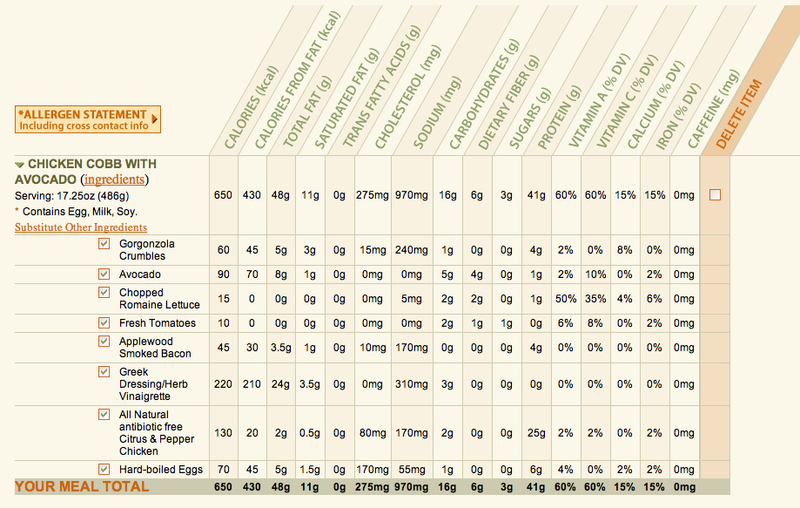 As shown in the screenshot below, the salad is very high in fat. The biggest culprit is the dressing, which packs 220 calories and 24g of fat. After seeing Panera’s nutrition information I decided to try to make a lightened up version of the salad at home, and it turned out great! 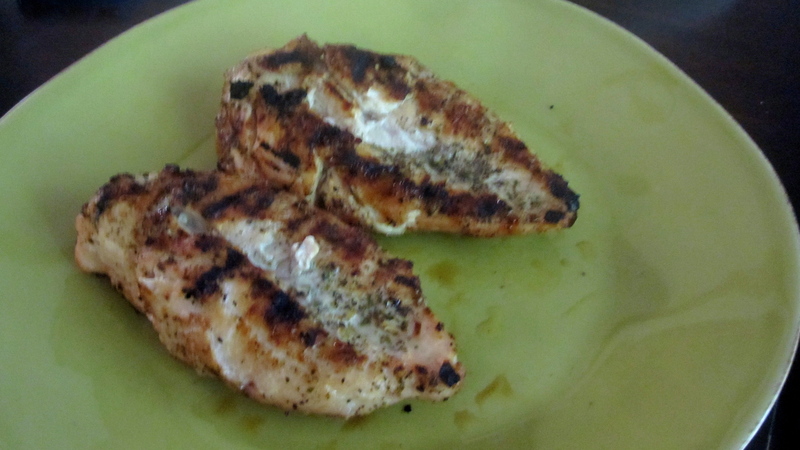 It was super filling and kept me going all day without snacking. Plus, I know it’s a big deal when Derek agrees that a salad is substantial enough to be a meal. He’s a hearty eater, and he enjoyed this salad. 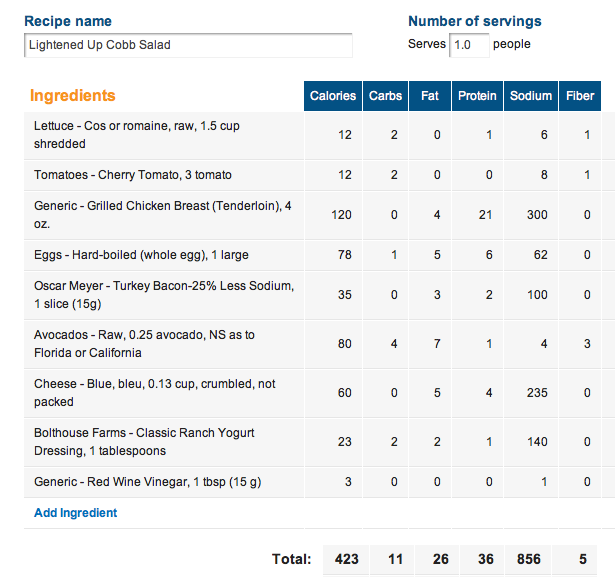 As you can see below, the lightened up version has about 200 fewer calories and almost half the fat of Panera’s cobb salad. The biggest difference comes from mixing Bolthouse Farms Classic Ranch Yogurt Dressing and red wine vinegar for the dressing. If your interested in trying the salad, I included the recipe below. 1. 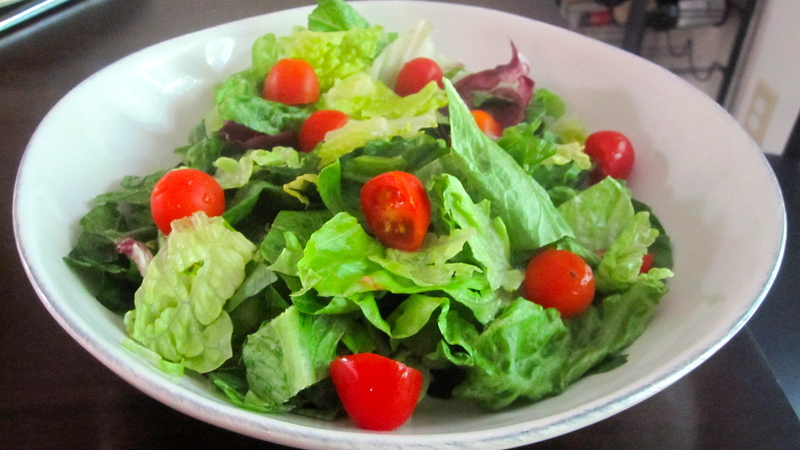 Create the salad base of romaine lettuce and halved cherry tomatoes (or whatever tomatoes you have on hand). 3. Hard-boil an egg. Slice it and add to salad. 4. Cook turkey bacon. (I put mine in the oven while I’m working on everything else.) Crumble and add to salad. 5. Cube avocado and add to salad. 6. Top salad with blue cheese and low-fat creamy dressing of your choice. 7. Add red wine vinegar for more acidity (optional).